Mostafa Ibrahim, MD, from the Theodor Bilharz Research Institute in Cairo, Egypt, discusses his New Methods article titled “Endoscopic treatment of acute variceal hemorrhage by using hemostatic powder TC-325: a prospective pilot study” from the November issue. Emergency endoscopic treatment for acute variceal bleeding (AVB) sometimes cannot be offered in every center because of the lack of resources and limited access in expert endoscopy services. Moreover, treatment may be technically challenging, and treatment failures are reported in 10% to 15% of the cases. The main focus of this study is to challenge a new concept in the management of AVB by application of a technically simple new technique to stop AVB and to give the opportunity for the endoscopists to definitively treat the varices in a better stable conditions. The early phase of AVB management remains important and challenging. The hemostatic powder (Hemospray) showed effectiveness in acute nonvariceal bleeding. This was the main reason that pushed us to think about the patient benefits if we used the same powder to stop acute variceal bleeding. Figure 2. 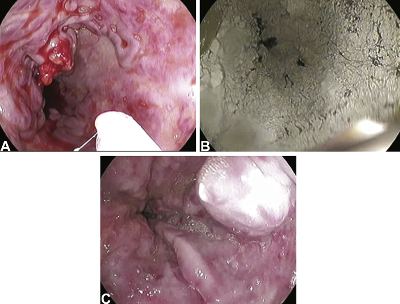 Representative images of treatment of acute variceal bleeding with hemostatic powder and at 24 hours post-procedure endoscopy. A, Bleeding esophageal varices before application of hemostatic powder. B, Appearance after application. C, follow-up at 24 hours. Nine consecutive patients with confirmed AVB underwent treatment within 12 hours of hospital admission. Bleeding stopped during the endoscopy performed with application of 21g of hemostatic powder from the cardia up to 15cm above the gastroesophageal junction. No rebleeding was observed in any of the patients within 24 hours. The next step should a bigger randomized control trial assessing the added effect of Hemospray. Hemospray could offer a new concept (bridge therapy) in the management of acute variceal bleeding. Read this article on page 769 in the print version or find it online.